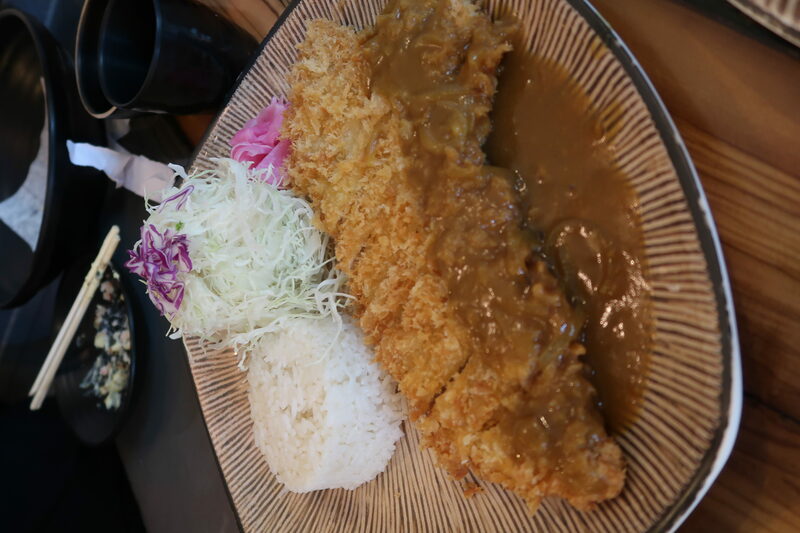 Have you been to Katsuya? 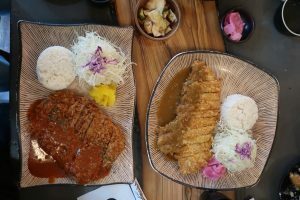 It is also one of the best 100 restaurants in Canada 2016-2017 by Yelp. 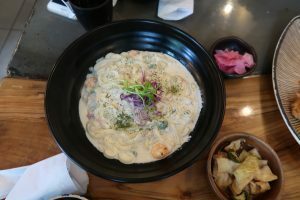 One of its 3 locations in Ontario is conveniently located right on the Ryerson Campus, directly across from the Kerr Hall building on Gerrard St, perfect for students to grab for lunch and go with friends! Katsuya serves delicious and authentic Japanese fusion cutlets with a large menu selections of different sauces. Carbonara, sweet chili, curry, teri mayo and many more. The variety of sauces satisfies everyone’s taste. The best thing is that their affordable and huge size cutlet plates also comes rice, salad and complimentary miso soup “all unlimited refills!” Great to share between 2 people if you’re not as hungry. Aside from their famous cutlets, Katsuya has a lot of special fusion appetizers as well. Their cheese crabmeat croquette dish was heavenly delicious! 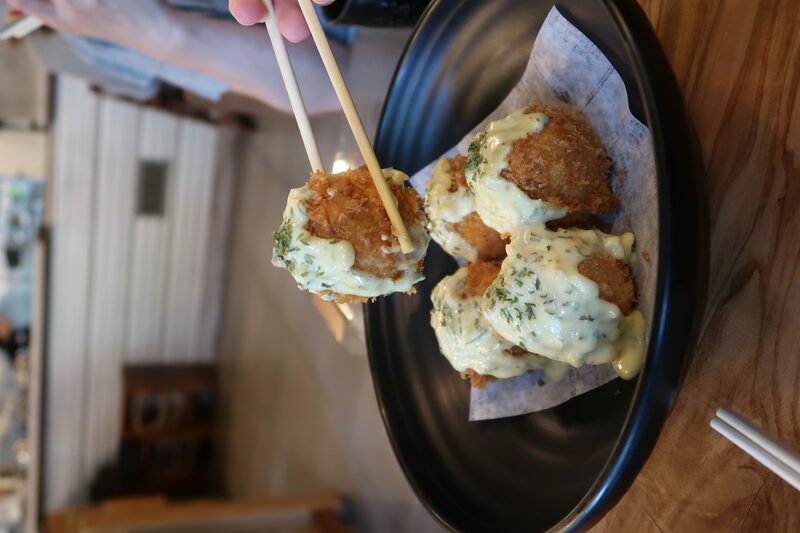 It’s by far my favourite croquette out of all the ones I’ve tried in Toronto. 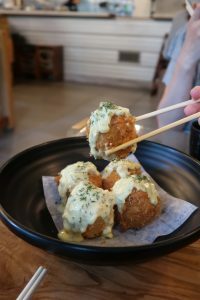 The dish came with 5 big pieces of fried “croquette balls” made with mashed potatoes, onions, melty mozzarella cheese and crabmeat. Not to mention their super crispy and crunchy shell, that brings all the flavours together in your mouth. 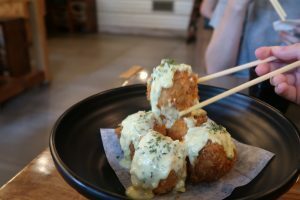 What a great appetizer to share and start off your meal! 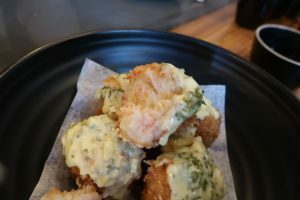 I would love to come back to eat only the croquettes, because they are just so gooood! 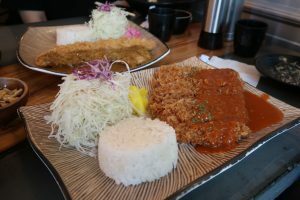 For all the Katsuya deep fried meat cutlet plates, you have the options such as pork loin, chicken, fish, sweet potato katsu, even pork loin katsu stuffed with mozzarella and/or cream cheese. 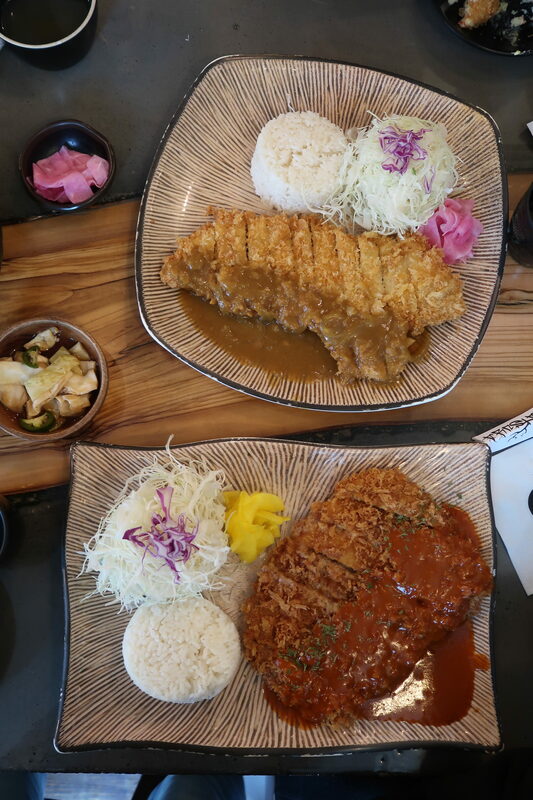 I ordered the pork loin katsu with the Japanese curry sauce, and the cheese stuffed katsu with the sweet chili sauce. 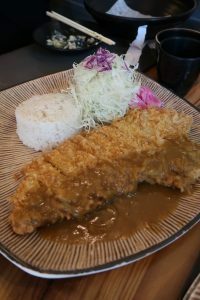 I love katsuya’s massive portion and the huge katsu, the plate was honestly like the size of my face, totally worth the price. Crunchy crisp coating on the outside, while the meat was super tender and juicy on the inside. 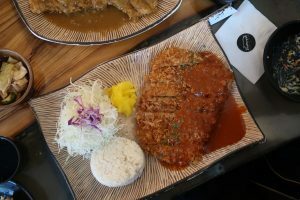 I totally recommend trying out the stuffed cheese katsu, because the cheese made the meat even more buttery and soft! 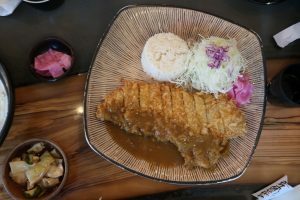 All of their sauces pairs perfectly with katsu, really rich and taste unique in their own way. I can’t choose which sauce I like more, but definitely coming back to try out more! 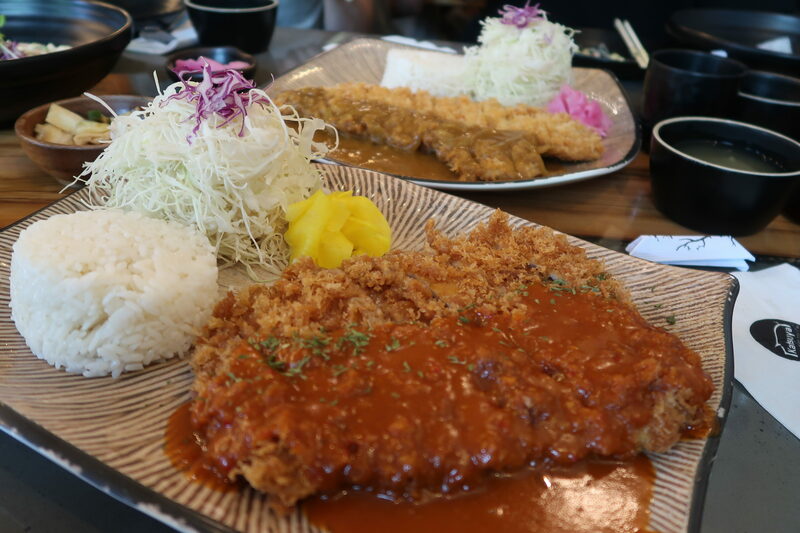 It’s okay if you’re not a big katsu fan, because Katsuya also got your back covered with their signature udons. 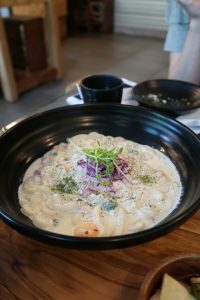 Being a carbonara lover myself, I was so stooked to try out this Carbo Udon. Their carbonara sauce was very rich and creamy with a very nice thick consistency. 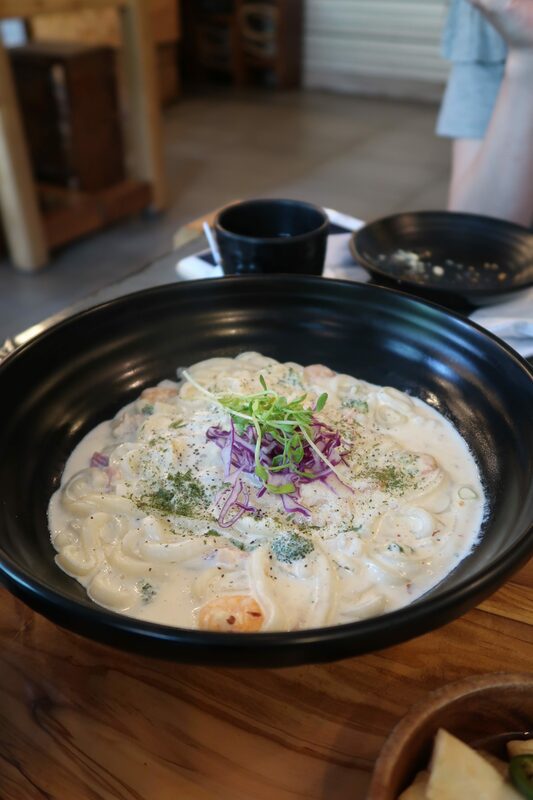 The udon noodle is chewy and cooked pretty soft. 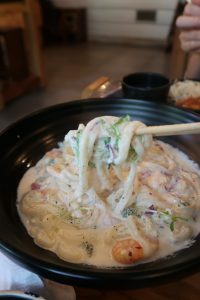 I definitely recommend this dish to seafood lovers to try, because you can find large pieces of fresh shrimp and squid mixed the pool of their signature carbonara sauce (even pieces of bacon too).